A-B-C Books, primers called in German Namen-büchlein, more recently Fibel (which is a derivative of Bibel), were a collection of religious readings for beginners. In the education of Anabaptists and Mennonites these booklets have played a vital role. Though the early Mennonites did not care for academic education, they yet wanted everyone to be taught reading and writing in order to be able to study at firsthand the Bible and other devotional material. The A-B-C books of former days were, however, very different from today's primers. The children learned the alphabet and then at once had to read the Lord's Prayer, the Apostles' Creed, the Ten Commandments, and various prayers. The oldest known primer used by the Mennonites is an 18th century Swiss Namen-büchlein of 1740 (copy in Mennonite Historical Library (Goshen), See Friedmann, Mennonite Piety, 213 and Plate V). In the United States Christopher Dock (d. 1771) was apparently the earliest Mennonite educator who worked in this direction. He wrote several sets of A-B-C rhymes for his pupils in the pious style of his time (Dock, Brumbaugh) and otherwise taught, in the same general way as Europeans did, the reading of sacred passages right after mastering the alphabet. Christopher Saur in Germantown printed an A-B-C und Buchstabierbuch, bei allen Religionen ohne billigen Anstoss zu gebrauchen for the German-speaking Pietists and sectarians, as early as 1738 or 1739. Whether it was much used among the Mennonites is not certain. The first original Mennonite production of this sort was Bishop Benjamin Eby's Neues Buchstabier- und Lesebuch, first published in Kitchener (formerly Berlin), Ontario, in 1839, which then passed through eight editions up to 1909, and was used primarily among the Mennonites of Mennonite Church (MC) background. This book, too, contains spelling drills, prayers, Bible passages, and pious sentences. It was in its time very much used. With such books children were taught High German in Sunday schools when the church at large was more and more shifting to English for its services (Bender). John F. Funk published an A-B-C Buchstabier- und Lesebuch (Elkhart, 1902, 1905, 1912) with similar contents, primarily for the Manitoba Mennonites who immigrated in the 1870s. Peter Schertz, Trenton, Ohio, published a one-page Das Goldene A-B-C.
Only a few copies of the A-B-C books used among the Mennonites in Prussia, Poland, and Russia are extant (Fr. Tr. Harmann; C. S. Weber, Striegau; Trowitzsch, Frankfurt; C. W. Hindemith, Kalisch, etc.). They usually had the alphabet, the Ten Commandments, some prayers, and on the last page the picture of a rooster. The Mennonites of the prairie states used the Liebhart A-B-C book published by the Abingdon Press (Cincinnati and New York), which was reprinted by Welty and Sprunger at Berne, Indiana, D. Goerz at Halstead, Kansas (1881), and the Mennonite Publishing House, Scottdale. The Mennonites of Mexico have printed a revised and abbreviated edition of the Funk A-B-C Buchstabier- und Lesebuch (of the illustrations only the rooster on the last page remained). 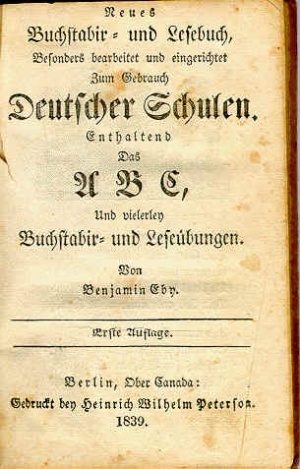 To help bilingual readers the Mennonite Publishing House published the Englisch-Deutsche Fibel, based on Sander's Pictorial Primer, and the Herald Publishing Co., Newton, published Witter's Deutsch-Englische Fibel (since 1925 in many editions). To help the Mennonites of South America in their educational efforts, the Textbook Committee of the Mennonite Central Committee published Leselust by Richard Lange in 1948. Bender, Harold S. Mennonite Sunday School Centennial. Scottdale, Pa.: Mennonite Pub. House, 1940: 40. Dock, Christoher, Martin Grove Brumbaugh, and Samuel W. Pennypacker. The Life and Works of Christopher Dock: America's Pioneer Writer on Education with a Translation of His Works into the English Language. Philadelphia: J.B. Lippincott company, 1908: 182, 241 f., 263 f.
Friedmann, Robert. Mennonite Piety Through the Centuries: its Genius and its Literature. Goshen, IN: Mennonite Historical Society, 1949. Reprinted Scottdale, PA: Herald Press, 1976: 213, plate V.
Friedmann, Robert and Cornelius Krahn. "A-B-C Books." Global Anabaptist Mennonite Encyclopedia Online. 1955. Web. 22 Apr 2019. http://gameo.org/index.php?title=A-B-C_Books&oldid=128432. Friedmann, Robert and Cornelius Krahn. (1955). A-B-C Books. Global Anabaptist Mennonite Encyclopedia Online. Retrieved 22 April 2019, from http://gameo.org/index.php?title=A-B-C_Books&oldid=128432. Adapted by permission of Herald Press, Harrisonburg, Virginia, from Mennonite Encyclopedia, Vol. 1, pp. 6-7. All rights reserved. This page was last modified on 10 December 2014, at 20:38.